Basically, in muddled, layman's terms, the Heisenberg Principle states that you can know the position or vector of an electron at any given moment, but not both, which is pissy, 'cause if we could, we'd be well on our way to inventing Star Trek transporters and all sorts of other lovely things by now. I'd also have less trouble with half-finished crochet projects. It seems I'm incapable of knowing both the hook-size and yarn weight on any project I have left down for more than a day. Unlike with knitting, where you need to keep the needles in or all hell breaks loose, with crochet, the hook can come out without having to call DEFCON 1. This does mean only one hook in each size is required (money saving tip), but it also leads to endless confusing when revisiting a project. So, I have decided to make my own heisenberg compensator (yes, I am that much of a nerd) in the form of a little label. I shall pop these little pieces of paper onto a corner of any project I have in the works, and this will save me from wibbly tension down the line. 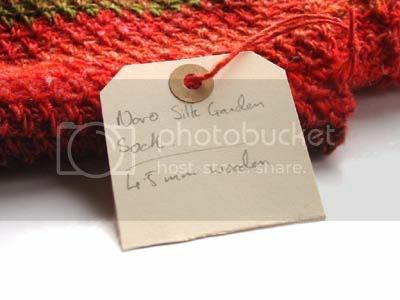 Might I also mention Ravelry projects page here? that's saved my muddled brain on more than one occasion. It does have the distinct disadvantage of requiring an active internet connection though. Fair dues to you and your being organised! Far as I'm concerned, if it's worth doing, it's worth half-doing and then forgetting about!